Sometimes I think my family takes the homeschooling truism, “there’s no such thing as a typical day” to extremes. 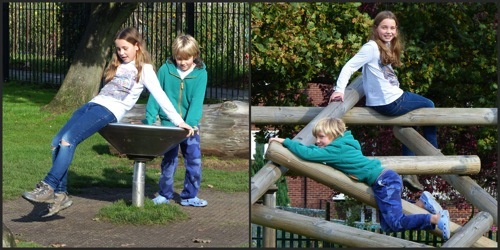 On a mythical “normal Monday” we would work through our short homeschooling routine, read a story or play a game over afternoon teatime, and go for a walk with our dogs. There would be no egg throwing, and definitely no rollercoasters. But as “normal” is never likely to happen, and since this time last year I enjoyed participating in a “Week in my life” blog hop, I thought it might be fun to record the same week this year. We’re expecting friends to arrive at around 10:00AM, so we get to work promptly on our daily maths and English routine. First, I do buddy maths with J(9). Then after a quick jump around, he does some “French dictation”. This is a Brave Writer idea, designed to introduce children to dictation. Next, buddy maths with C(10). She usually uses Ed Zaccaro too, but occasionally we work through British materials instead, to check for gaps and reassure C(10) that she’s on track. No sign of our friends, so we head to our local park with the dogs. Pancake time. I dictate an excerpt from Catching Fire to C(10) while I make the batter. She’s using Brave Writer’s Boomerang this year. C(10) writes beautifully, but dictation is proving very useful for picking up and dealing painlessly with small errors. Today’s passage gave us the opportunity to discuss how “too” and “to” are used. We eat our pancakes while reading about James VI in The Story of the World vol 2. C(10) has been learning about this period in her homeschool group, so she entertains J(9) and I with extra details. C(10) practises guitar. 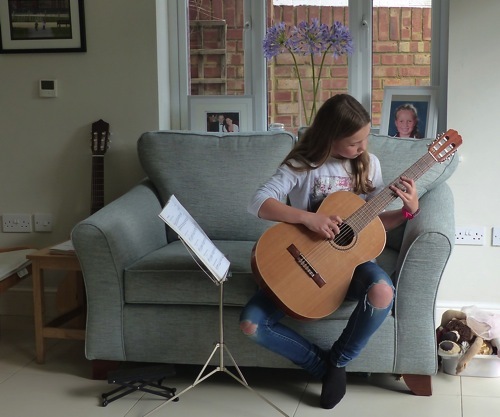 She and I are both working towards classical guitar grade 5 exams this year. Because our day hasn’t been quite busy enough, after our friends leave we decide to head to a local theme park. Seriously though… We save up grocery store points to buy annual passes which cover the three big theme parks near us, and our coupon for C(10)’s pass is about to expire. While we’re there we have to go on a few rollercoasters, of course. Can you see C(10) there on the right? J(9) is so excited that by next spring when the parks reopen, he’ll be tall enough to go on this one, which C(10) rides on her own this time. 6:00PM Tacos for dinner. My guitar practice, then off to the gym for half an hour on the cross-trainer while C(10) does in her karate class. 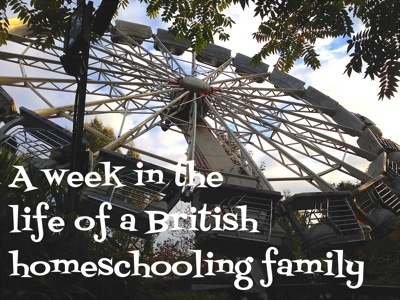 For more Week in Life of a British homeschooling family, see Tuesday, Wednesday, Thursday and Friday. 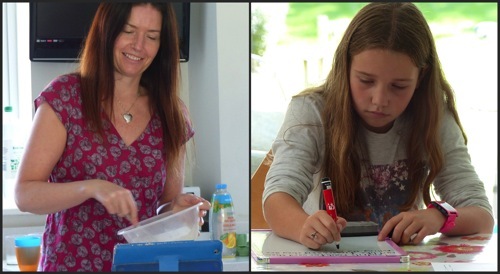 And see Week in the Life of a British homeschooling family 2013 with children aged 8 and 9. Perhaps you’d like to share a normal (ha!) day in your homeschooling life? Your week is off to a very good start, what with egg-throwing and going to the theme park! Even with those, you’ve managed to get a fair bit of work done. I’d say that’s a very good day! I can’t believe how small the HE world is (or maybe it’s because we go out so much)! I believe I’ve actually met your friend and her boys (C and O) a number of times before! Thank you so much for your encouragement. I do enjoy being able to look back on this snapshot of our home ed life. I just hope people don’t feel like I’m spamming their inbox with my daily posts! A normal day? Are we supposed to be having some of those? I must have missed the memo…updating our schedule now 🙂 Your day, if not normal, looked like a crazy lot of fun – really like the eggs! Yeah the memo passed me by too… I’m so pleased! It’s always interesting catching a glimpse of other people’s lives. You set out for the theme park at 3 pm? Oh my! We’d have to set out early in the morning if we wanted to go somewhere similar. I love how you make the most of your day. It’s never too late to do something by the sounds of it. By 3 pm I wouldn’t be thinking of going out (unless I had to). Thanks for sharing! If if were up to me, we would probably stay in most days, and we certainly wouldn’t be gallivanting off to theme parks in the middle of the afternoon! But I always seem to enjoy these outings, and I tell myself there’ll be another season in my life for quiet days at home. 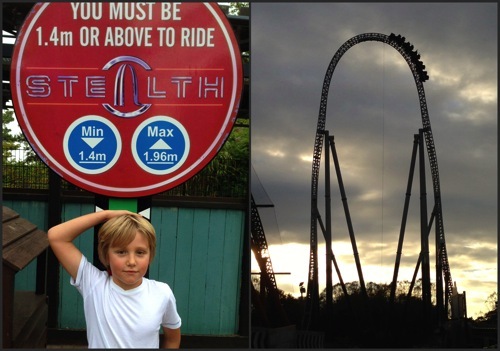 Looking back, I don’t think I made it clear in my post – the only reason we went to the theme park was to redeem the voucher before it expired – so there were definitely special circumstances! I think perhaps we are also trying to make the most of the fine weather before winter. By the way, I am halfway through your latest podcast which I am enjoying very much. I have also had to order a second copy of your book – I had to leave my first copy with a young friend who started reading it and couldn’t be parted from it! I shall be over to catch up with your blog and FB page soon! I love your days. They are so full of goodness! Oh, and I am hopelessly jealous of your Spanish trip. We have got to get out more! Thank you, Sharon! 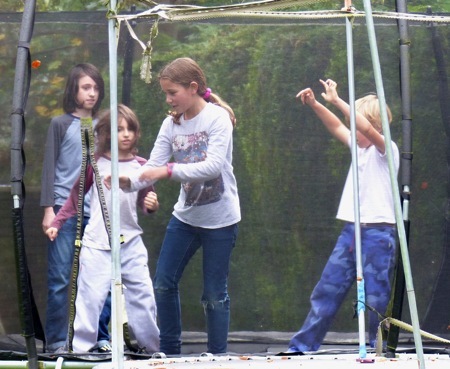 Re the pics – it does feel a bit like starring in our own reality TV show this week! I love reading about people’s day-to-day homeschooling lives. It’s fascinating to see how many different ways there are of doing things. I am usually inspired to steal a few ideas, too. Please do come back and leave a link if you do do a similar post! I’m always scared to do a day in the life post because then I’d have to admit how late our schooling starts. Please do it, Ticia! I’d love to see one of your days. I bet there are loads of mums out there who start later like you, who would be so relieved to hear school doesn’t have to start at 9! I’m a morning person. Having to function after 7pm wears me out. I’m exhausted just from blogging every night this week! Eating pancakes, gallivanting with friends, throwing eggs at the garden wall, and going to the fair – maybe if I show this to P, she’ll let me homeschool 😉 I’ll skip all the educating along the way, of course!